Re Santa Messy Room info about the game-Games2Rule. 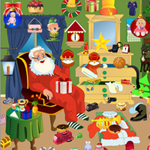 Santa Messy Room is another point and click hidden object game from Games2rule. Santa room is so messy. It's our time clean up Santa room. Leave Christmas related objects and remove other objects to make Santa room clean. You can find up to 5 hidden objects using hint options. Find the hidden objects in short duration to get high score. Good luck and have fun!